State Representatives Tony McCombie, Mike Halpin and Dan Swanson are encouraging local residents to support Valley Construction, of Rock Island, in their efforts to help the Houston area recover from Hurricane Harvey. “Valley Construction and other partners within our region continue to amaze me! I am honored to help push this relief effort to our districts to not only reach our goals for the people of Texas, but also help prepare to provide relief to people of Florida” said Rep. McCombie. “Valley Construction has been supportive of the Quad City Community for years. It is no surprise that the company is extending its generosity to those affected by Harvey’s devastation, and I believe our compassionate community will step up and contribute what we can to this important cause,” said Rep. Halpin. 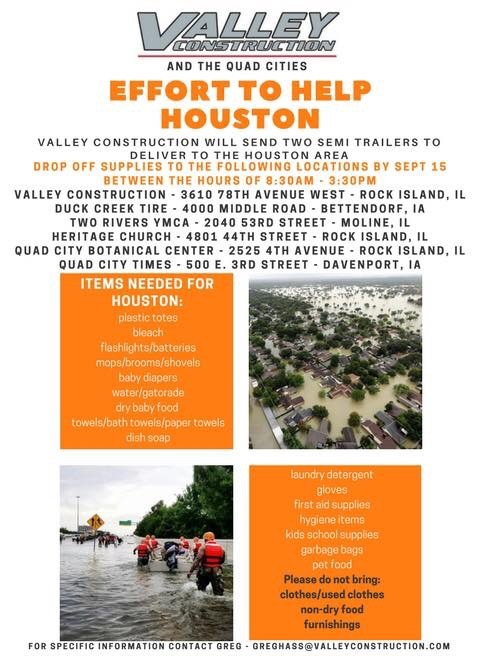 Valley Construction will be sending two semi-trailers full of supplies on Saturday, September 16thto the Houston areas impacted by Hurricane Harvey, and is asking the public’s help to fill those trailers. If more than two trailers of supplies are collected, Valley Construction will be sending the additional supplies to areas impacted by Hurricane Irma in Florida. They ask that you bring the items to one of the following drop off locations by Friday, September 15th; drop off times are between 8:30am and 3:30 pm. “Thank you to Valley Construction for offering this assistance. The Quad-Cities is a generous area and I appreciate our residents showing such compassion and concern for friends and families in Texas and Florida. When the Quad-Cities has needed flood assistance, help has come from many parts of the United States; now it is our turn to provide comfort and relief to those in need,” said Rep. Swanson. The items needed include; plastic totes, bleach, flashlights, batteries, mops, brooms, shovels, baby diapers, water, sports drinks, dry baby foods, bath towels, paper towels, dish soap, laundry detergent, gloves, first aid supplies, hygiene items, kids school supplies, garbage bags, and pet food. Valley Construction asks that you don’t drop off clothes, furnishings and perishable foods. For more information about the supply drive contact Greg Hass at Valley Construction by email at greghass@valleyconstruction.com.